I started my little boy at a different time than my girls…I started all 3 of them at different ages based on when I thought they were ready. I thought my son was ready at about 5 and half-6 months…I first check with the Dr. (I have an amazing pediatrician) and he suggested starting off with a spoonful of baby cereal (rice) with or without fruit mixed with formula. And then later on in the day offer some jarred food. He suggested starting off with the veggies. And of course my curiousity for learning made me ask why veggies and not the meats or the fruits. He said cause the veggies aren’t as sweet as the fruits and you may have better luck introducing him to veggies he likes if he doesn’t really know the sweet fruits that are out there. Amoung my son’s favorite veggies were sweet potatos and squash. And even now that he is over 2 he still loves his veggies (so not like my girls who I didn’t know of this veggie tip when i began them). My son will devour a salad in no time flat. Ever see a 2 yr old eat salad..its kinda cutish funny. Anyways then when we did introduce the fruit, he liked most of them but his favs were the banannas (I recommend for bedtime cause they have a natural thing to make them relaxed) and apples. So there is my take on it. I hope this helped you at least some. I forgot to add how I knew my son was ready…sorry…he began to not seem satisfied by the bottle alone..he began chewing his hands even after the bottle. (heck he was chewing his bottle). When you do decide to start feeding jarred food, I must warn you the baby will reject the first few bites but this is not intentional. 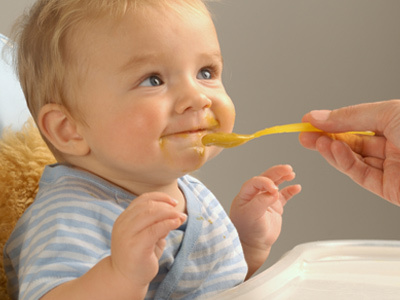 Baby is just trying to figure out how to get it from the tongue to the tummy and the tongue will push it out not in…this does not mean he/she doesn’t like it. It just means laugh, wipe the chin, and try again lol. Just offer a little bit and see what happens. He’s still getting the bulk of his nutrition from the formula right now, which if completely normal & expected until 12-ish mos anyway. And even then, I wouldn’t push weaning from his bottle until you can see he’s ready. Basically, trust your instincts. Don’t worry about what other ppl tell you he should be doing or you should be doing. My little man is 8 months and is already eating table food and refusing the bottle. And he is not a big chunky baby at all. In fact at his last visit a month ago he was only 14.4 lbs. Anyway, I started cereal with him a little over 4 months and started gerber stage 1 at 5 months. I really didn’t notice any signs, I just wanted to start him on foods and when I asked the doctor she said it was okay. I started on the weekends (cause I’m home all day) and introduce it at a meal time. Then started doing veggies when I came home from work. What I did was give him a bottle, then two hours later the fruit or veggie (so he won’t be extremely hungry when giving him the food) then two hours later another bottle. I noticed he was eating the entire pack and didn’t really seem full. When his teeth started to come in I decided to try the stage 2 and I would mix it with the cereal from time to time. We went to the doctor he still wasn’t gaining any weight so she suggest to give him more food. To start feeding him like a toddler. I then introduced stage 3 and realized he still wasn’t full. So now at 8 months my little man is eating table food, and the gerber graduates. I give him the gerber graduates meal if I don’t cook that evening. He gets a bottle in the morning when he wakes up, he eats food through out the day, or a bottle here and there (doesn’t really drink an entire bottle during the day anymore) and I have healthy snack for him, and then a bottle at night right before bed. He is still slim and slender, but he is also very active, trying to walk, climbing the stairs, crawling everywhere. I never new what signs to look for other than him reaching for your food. At about 4 months he would stare at our plates. I am nervous to go to the doctor this week because I don’t want them to say oh he still hasn’t gained any weight. My little man can eat, but he won’t put the weight on. my baby is 5 months old. i’ve been giving her baby food for about a month now and she absolutley loves it. but my doc said start her off with fruits the veggies. im just now starting to give her some vegetables. she will eat a whole bottle of stage 1 baby food with no problem. alot of times i’ll mix some cereal with her banana’s or pears and she loves it. she also started very early on the cereal. just her formula didnt satisfy her, i’ve been puttin cereal in her bottles since she was 2 months old. she wouldnt have it any other way. i think all baby’s are different, you just have to get your pattern of how you want it done. none is all alike. my baby is two month today can i feed him baby food,like baby apple sauce??? I found this blog while searching for healthy pregnancy food today. Interesting. Hi, My nurse told me that when my son reached 4 months that i could give him solid foods,but i thought that the guidelines were to wait till your baby is 6 months old? i was breastfeeding him but had to wean him onto formula because i had to go back to work. the nurse told me that the bottle alone wouldnt satisfy him for long…ive started giving him baby rice and veg but im wondering have i made the right choice? Each situation and each child is different. If you child is showing signs of being hungry even after a bottle then I don’t see why you can’t introduce a little food in. My oldest had reflux as a baby and had a terrible spitting up problem. The doctor suggested I thicken his formula with cereal to keep it down better. You are the mom and you know what your child needs. Follow your instincts. And when you make a choice and someone has something to say about it, just tell them that you are the mother, not them. 🙂 Hope that helps!